What do you do when you desperately need to put a parking garage into the bottom floor of your Victorian apartment building, but the city's Department of Planning says "No". The simple and expensive answer: Create an elaborate secret garage door. If you own a pretty building, it is well within the jurisdiction of the Landmark Commission to inform you that even though you own the piece of property, you cannot remodel it any way you want. Seems un-American. But in San Francisco, specifically the Haight-Ashbury district, homeowners have to atone for the sins of others, because so many beautiful Victorian apartment houses have been flattened in the recent past. Just look at the ugly stucco beast on the left hand side, and you get the idea. Turns out, Ben McMills has a mechanical engineering degree from UC Berkeley and a construction company of his own. So giving a facelift to classic building was not a huge challenge. They teamed up with Beausoileil Architects, and to (barely) satisfy the requirements of the City Planning Department and the Secretary of the Interior Standards for Rehabilitation of Historic Buildings, owner Corey McMills chose to preserve the outward appearance of this Victorian apartment building. There is a good deal of wood and steel in the final design, so hydraulics rotate, pivot, and slide the elaborate facade. No question, the hardest part of the project will be the daily challenge of keeping cars from obeying the "No Parking Sign", when it is inconceivable that there are four cars behind those quaint bay windows. 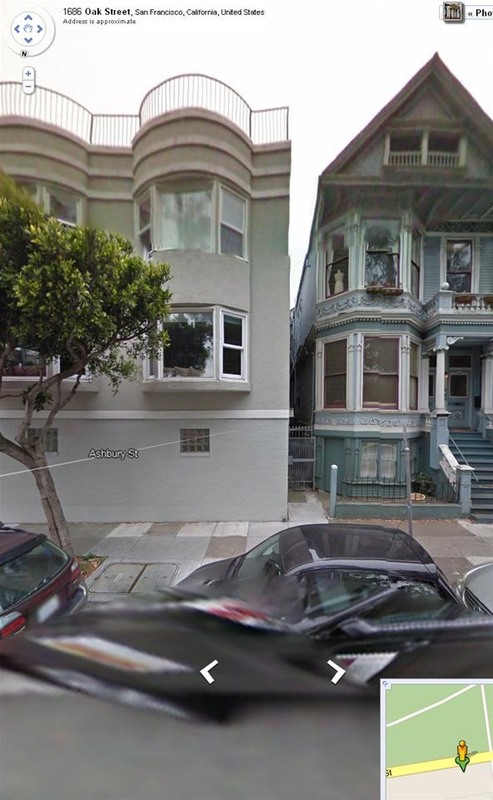 We searched on Google Maps at the corner of Oak and Ashbury and found the original building before the facelift. You be the judge. We think he made it nicer. Shhh, Don't Tell the Neighbors. This is awesome! But how small is this guy's car?